I really thought we’d have a busy day at the farm today, but the weather interrupted that. It rained all day—and I mean all day! There was not a lot of activity as most of the horses preferred to stay inside their run-in sheds, and the people (me!) preferred to stay dry as well. I took a few minutes and drove over to the annex farm in Midway, thinking I could spend some time with Wallenda. When I arrived, something in the neighborhood had all the horses wound up—every horse I could see was staring across the street. That was a lot of horses looking at the same thing, as every field as far as you can see has horses in it! 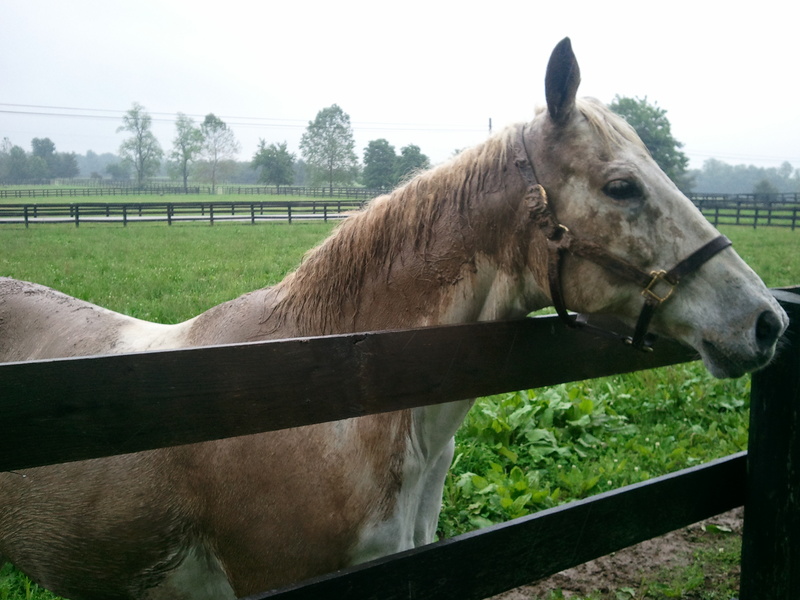 I think they must have turned a bunch of yearlings out at Darby Dan and it had every horse fascinated. Even Benburb, who was outside in the front paddock and rarely gets excited about anything, was neighing and prancing. Bennie was unbelievably muddy. With all the rain, the mud was the consistency of chocolate milk, and white Bennie was covered, with mud dripping down his face and neck. I hung around long enough to take a photo of Wallenda staring out his stall window, and then headed back to the main farm. 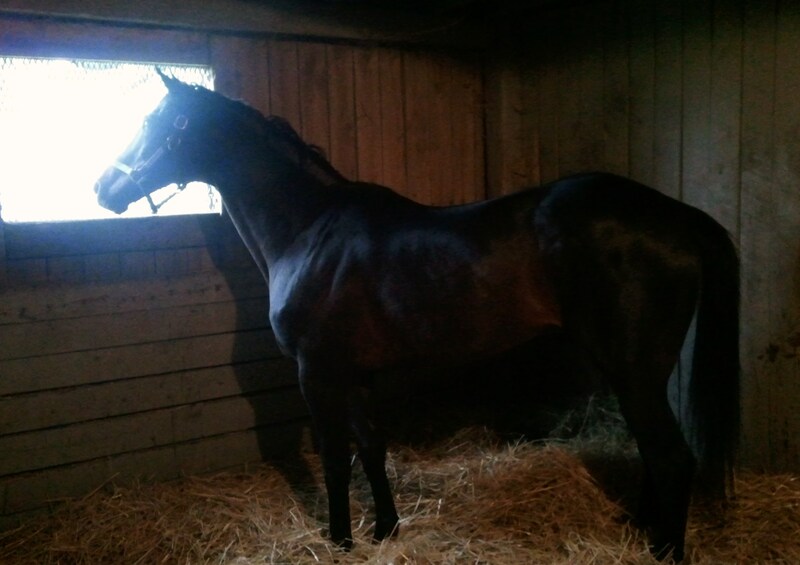 I ducked inside the small barn to say hello to Arson Squad, thinking I’d take a picture of him to share. 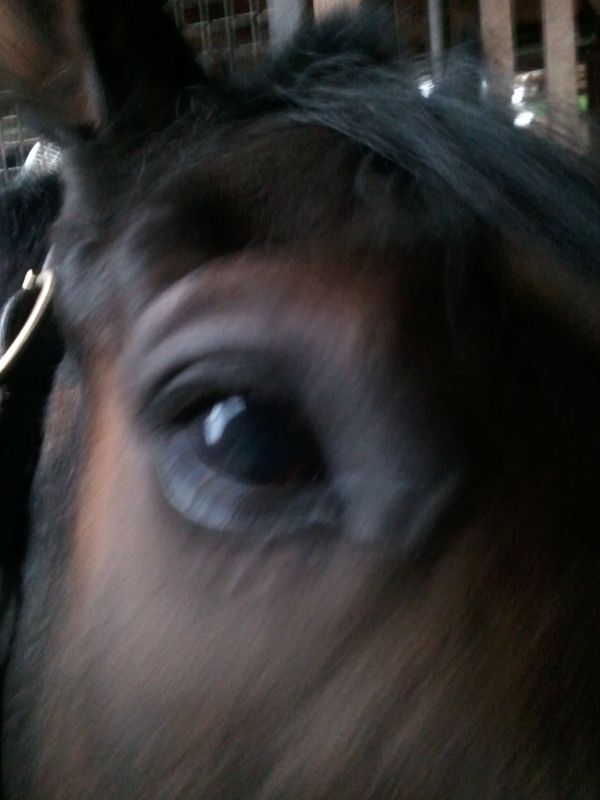 But he was more interested in checking out my phone. You can guess how the photo session worked out. Dan and Flick were in their shed and Clever ventured out just long enough to know he had to dash back inside. I wasn’t quick enough to get a picture of Clever. He wasn’t outside long enough to get the camera out of my pocket. Gulch, Sunshine and Patton were in their sheds too, although Afternoon Deelites was outside grazing. 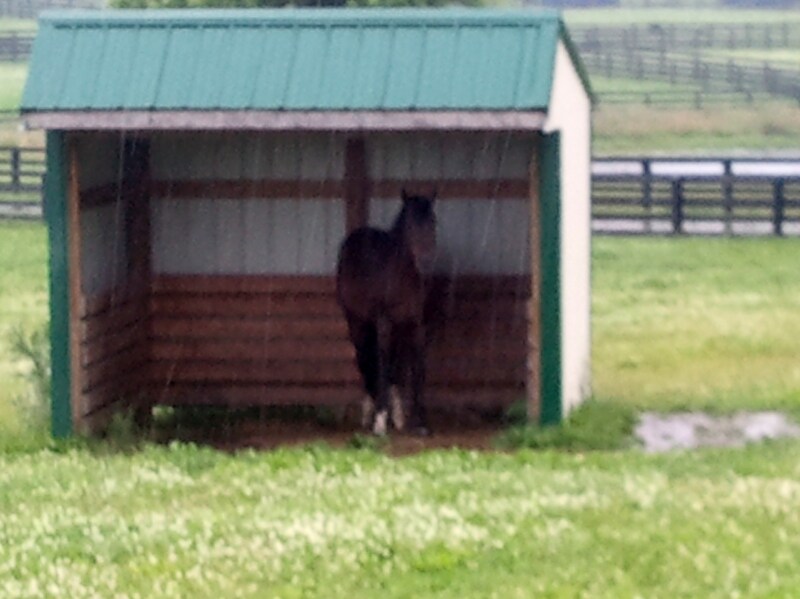 Marquetry was napping in the rain at the far side of his paddock. He must have decided he needed a bath. I ended up taking a picture of Swannie who was, of course, hiding in his shed. It wasn’t a day that anyone much wanted to be outside. This is a short post, and I hope the weather is nicer wherever you are.